Central and modern apartment. Fully equipped and furnished. One separate bedroom, a tiled bathroom, integrated kitchen and living room. Fully equipped and furnished apartment in downtown Oslo. The apartment has one bedroom, a tiled bathroom and integrated living room and kitchen. The kitchen is fully equipped in such a degree that it can serve as an adequate alternative to own home. The apartments also have private balconies and are part of the Theatre Quarter, a residential quarter which was completed in 2008/2009. A short distance from the main train station, bus station and all of the metro lines, this gives you a good starting point if you want to experience Oslo and its surroundings. Please note that we have several apartments on this location and that the pictures are meant as an example of how the apartment looks like rather than the actual apartment. All of our apartments have similar furnishing and the same equipment, so the main difference between the apartments are the floor planning. You can read more about us and our apartments on www.bjorvika-apartments.no/en. Located in a new and exciting part of the city, Bjørvika Apartments offer a temporary home for you who request freedom as well as comfort. Enjoy the urban city environment from a new, modern and central apartment in an area that is becoming one of the most attractive parts of the city, within short distance from attractions such as the Opera house. The central location is reflected in the short walking distance from both Oslo Central Station and Oslo Bus Terminal. After spending hours on a plane, and later on a bus or train, it is comforting to know that your apartment is only a 5-10 minute walk away from the train station and the bus terminal. 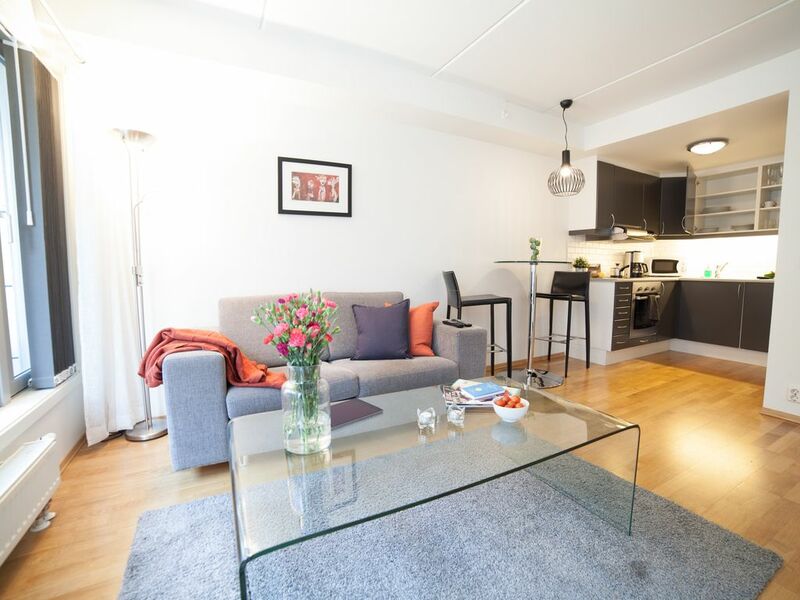 Bjørvika Apartments administers over 130 apartments for short term rental, perfect for you who travel alone, for couples, friends or colleagues, and even families or groups. You can choose your apartment from a selection of three different apartment types with one, two or three bedrooms. If you are in need of a baby cot or an extra bed, we can arrange this for an additional charge. All buildings have elevators for easy access to the various floors. If you like to enjoy a cup of coffee outside in the morning sun, you might be interested to know that most of our apartments have private balconies. In addition, there is a communal roof terrace that is open to everyone. Toilet, sink, shower and washing machine. The shower can be compressed to make it more spacious bathroom when not in use. We stayed the apartment for 3 days and had a wonderful time is Oslo. We were greeted at the management office which is within walking distance from the central train station and the apartment. The staff was very friendly and waited for us as we arrived at 11:00 PM. The apartment is centrally located and has everything that we needed for our stay. The bed was very comfortable and we asked for additional pillows which were brought to us that same day. I would recommend this apartment to everybody as it was very clean and in a great location very close to the city center , coffees and restaurants. We will be back! Late check in fee for bookings arriving after 23:00 o'clock. Late check in has to be arranged in adavance and is only subject to availability.